Huawei, the Chinese smartphones brand has announced their flagship device for the year 2014, with the Huawei Ascend P7 being announced at France, and the device comes as a perfect successor to the P6. There are upgrades made in not just the design, but the camera and the screen where you get to see the following in the screen department – a 5-inch display with the 1080p resolution (1920×1080 pixels), having a Gorilla Glass 3 protection. The design improvements include the Gorilla Glass 3 protection even on the rear panel, which is made with a micro pattern made by Huawei with a seven stage treatment. The weight of 124gm is what makes this quite an attraction, along with the 6.5mm thickness. The dimensions of the device make it quite taller, thinner and narrower than the Galaxy S4 from Samsung. There’s an LED notification light on the top of the display. Underneath the display, the smartphone comes with the HiSilicon Krin 910T chipset from Huawei, a quad-core one clocking at 1.8GHz with the Cortex-A9 CPU, and these have got the support by Mali 450 GPU and 2GB RAM. Huawei is sticking to its Emotion UI, while it is the Android 4.4 KitKat running in the device, the Emotion 2.3 UI is on the top of it – and it comes with the visual improvements such as new permission manager, a changed Do Not Disturb mode and a different power saving mode. The camera in the Huawei Ascend P7 is quite a lot of improvement from the predecessor – a 13-megapixel rear camera with the Sony BSI sensor, f/2.0 aperture and the LED flash. It can record 1080p Full HD videos and there is voice activation feature for voice and video captures. On the front, there is a 8-megapixel BSI sensor and a 5-piece lens with the IMAGESmart 2.0 software which would assist in 10 level auto-facial enhancement and wide-angle photo function. And there’s a special from Huawei – “groufie”, a special shooting mode which would help in taking panoramic group selfies. The Ascend P7 comes with 16GB internal storage, and there is a MicroSD card slot which supports the storage expansion by 32GB. The 2,500mAh Li-Po battery in the device is said to be capable of giving 404 hours of 4G stand-by time and 14 hours of talk time. According to the company, the phone takes 3.5 hours to get charged to 100%. Connectivity wise, Huawei has managed to provide 4G LTE connectivity to the additional local connectivity options – Bluetooth 4.0, Wi-Fi 802.11n, microUSB 2.0 and NFC. 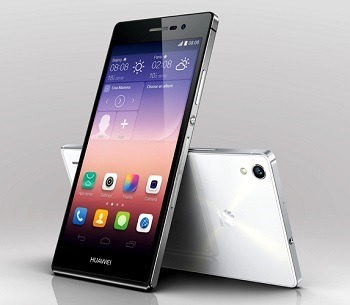 The markets where the Ascend P7 will be available, include China, the United Kingdom, Germany, Italy, France, Spain, Portugal, Ireland, the Netherlands, Belgium, Switzerland, Poland, Lithuania, Estonia, Latvia, Serbia, Greece, Norway, Hungary, Denmark, Slovakia, Czech Republic, Austria, Hong Kong, Thailand, Malaysia, Philippines, Singapore, Saudi Arabia, Kuwait, and the United Arab Emirates. There would be black, white and pink color options, and the pricing is set at €449. The availability in the markets will start from May 2014.